The images above represent a portion of the mise en place* a single hot station needs on hand every night in order to execute the dishes on Chef Fancher’s ever changing seasonal menus. 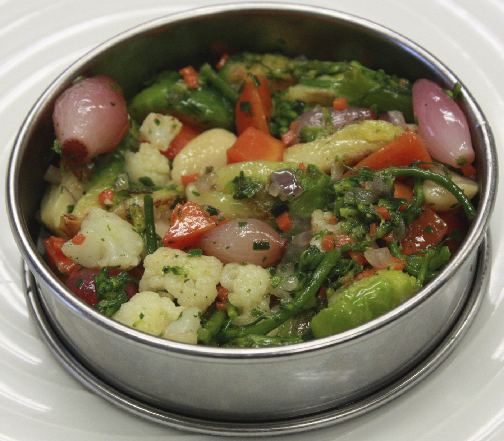 They also form the basis for a request for a Vegan entrée, which we are happy to prepare a la minute. 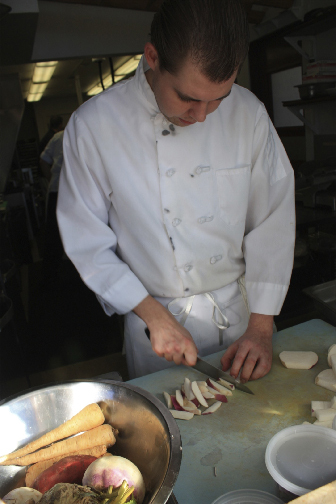 The better the mise en place, the greater the opportunity to create a memorable produce- inspired dish. Barndiva’s kitchen under Chef Fancher relies upon a traditional French “Brigade” system where the lead chef on a hot or cold line must have mastery over the focus of a single station. Pulling as we do from the most superlative produce gardens in Sonoma County, the Entremetier ~ the chef in charge of the vegetable station ~ is a pretty important position. Andrew Wycoff is Barndiva’s talented Entremetier who arrives each morning to face hours of prep where his mise en place will be essential to our dinner menus, as well as providing a vibrant display of creative possibilities when animal proteins do not figure in a dish. First thing to hit the heat with this dish were the Baby Yukon Gold Creamers ~ slowly simmered in salted water until soft, then peeled of their skins. 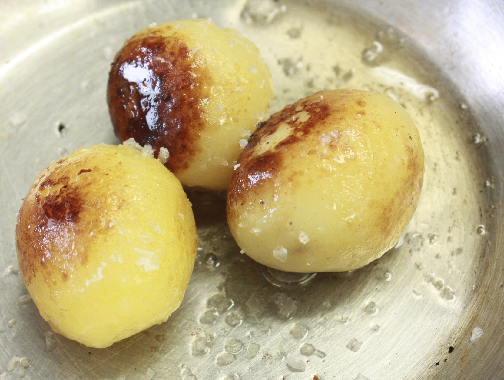 They were then roasted in a hot sauté pan until golden brown and finished with olive oil and Maldon Sea Salt. While the potatoes were roasting Chef specified which winter vegetables to use: cauliflower – broccoli – pearl onion – carrot – pumpkin – Brussels sprouts. These were sautéed and finished with sage & olive oil. 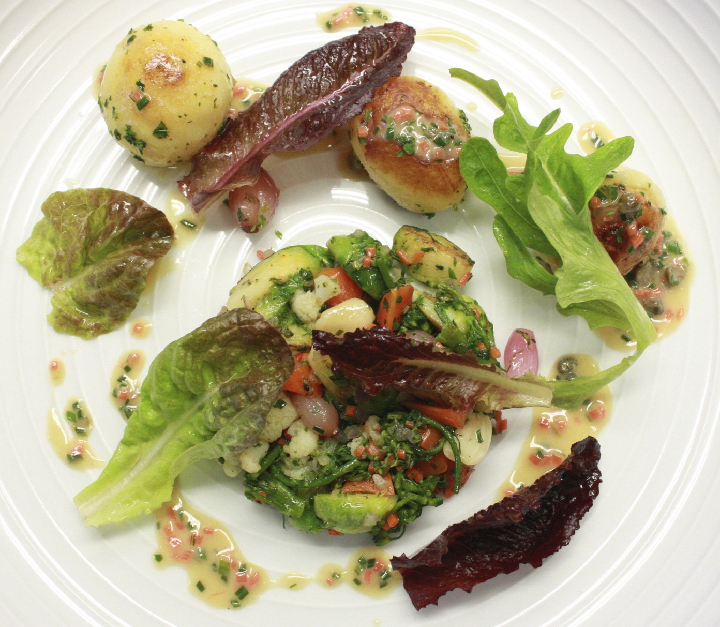 The lively mustard vinaigrette, pulled from another station with mise en place prepared by our Garde Manger (salad chef), Hugo Hernandez, was comprised of spicy brown mustard – champagne vinegar – grape seed oil – shallot – carrot dice – leek dice – chive – chervil – salt & pepper – pinch of sugar. To finish the dish Chef Ryan chose a loose ruffle of spicy local greens – an heirloom variety from Mix Garden. Then this delightful Vegan dish, which took hours to prepare though only a few inspired moments to cook was off to the dining room. *Mise en Place ~ the collection of ingredients (e.g. cuts of meat, relishes, sauces, par-cooked items, spices, freshly chopped vegetables and other components) which are specifically prepared to execute each dish on the menu.